WASHINGTON — He starred in side-splitting comedies like “The Jerk” (1979) and “Planes, Trains & Automobiles” (1987), while she dominated the music charts with hits like “What I Am” (1988). 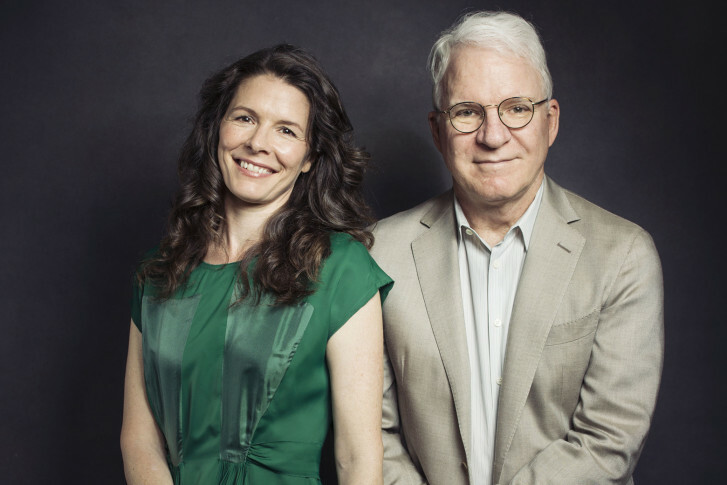 But no single medium can contain the imagination of Steve Martin and Edie Brickell. Amid their Grammy-winning bluegrass collaborations, the duo found time to create an original stage musical, “Bright Star,” which runs at the Kennedy Center through Jan. 10 before hitting Broadway. “It tells the story of a young woman and how she matures. There’s a secret in her life that comes to be resolved toward the end of the play. … We have an interesting hook in the story that’s shocking to the audience; I don’t like to give that away,” Martin tells WTOP. Why not share the secret? “That costs $60,” Martin jokes. Set in North Carolina between 1923-1945, the musical follows successful literary editor Alice Murphy (Carmen Cusack) who meets an ambitious young soldier just home from World War II. “(Martin) has no ego with his material, and I don’t know if that comes from being a comic first, that you just have to keep continuing to try things in front of an audience. And very much I think that’s what writing a good musical is about, staying open-minded, staying open-hearted … There’s just been no ego at all, with both of them, and they’ve continued to evolve with this story,” Cusack tells WTOP. While the production has evolved since its inception, acclaimed Broadway director Walter Bobbie says the initial script — written by Martin with lyrics by Brickell — blew him away from the start. “I’ve actually known Steve a long time socially. … Steve walked over the script to my apartment, because we only live a few blocks away from each other. And I got to the end of the first act, I was sitting in my chair, and I had the most remarkable and unique experience. I literally gasped, which doesn’t happen when you’re reading. … I went oh my god, I have to do this,” Bobbie tells WTOP. Making Bobbie gasp is no easy task. After all, this is the same man who won a Tony for his Broadway revival of “Chicago” in 1996 after Bob Fosse created the original show from 1975-1977. “Bob Fosse’s agent said one of the best compliments I ever read. He said that if Bob was still alive, that’s how he would have done it. … We used ‘Chicago’ to create an homage to his career, to his visual imagination, to his sensibility, so it feels very much a tribute to him, it feels like a Bob Fosse show, and yet it’s really not very much like his original production at all,” Bobbie says. Cusack, who will make her Broadway debut in “Bright Star,” says she was initially star-struck to work with a trio of entertainment titans like Bobbie, Martin and Brickell. “It was very daunting in the early stages. … I mean, Edie Brickell! I grew up (singing), ‘What I am, is what I am!’ And then Steve Martin! ‘The Jerk!’ ‘It’s all the stuff!’ So it’s very daunting in the beginning. … I just thought, all I can do is what is coming completely organic and natural to me, and they’re digging it. So I’m like, I just have to keep doing that,” Cusack says. Add her to the ranks of other ’40s writers: Rosalind Russell in “His Girl Friday” (1940), Katharine Hepburn in “Woman of the Year” (1942) or Barbara Stanwyck in “Christmas in Connecticut” (1945). “They’re archetypes … but smart, strong women emancipated well before their times,” Bobbie says. So why did Brickell and Martin choose this time period? “It’s a beautiful era. The style is luscious,” Brickell says. This throwback setting matches the musical’s classic tone. “”I think of it as newfangled old-fashioned. … The show — as melodic and sentimental and kind as it is — is actually quite shocking. … There’s a couple of very shocking moments in the play that keep it modern. … I called the musical sentimental; I meant that in the best sense of the word … They have arguments, they break apart, they come back together. You know, the best side of life,” Martin says. “It’s about someone finding the truth of their own past in a profound way. Because it’s Steve Martin and Edie Brickell, obviously there’s a great deal of humor, but it’s not a wild and wacky comedy. It’s a heartfelt human drama with a lot of good laughs. … We will make you laugh, and we’ll break your heart, but we’ll send you out just stomping your feet and humming the tunes,” Bobbie says. “Every time we hear it, I think we’re so lucky that it floated down to us, because it sounds like a song that should’ve already been written. It’s so simple. I can’t believe it came to us,” Brickell says. However, not every song made the cut. If anyone knew the late great Nichols it was Brickell’s legendary musician husband, Paul Simon, who teamed with Art Garfunkel to score the soundtrack for Nichols’ masterpiece “The Graduate” (1967). But don’t expect to see Simon and Brickell swapping songwriting notes in the living room. “When you have two songwriters living together, you recognize that songwriting is a very private and independent expression. Paul is so busy doing the Paul Simon schedule, that when we get together in our home, it’s about our kids or our dinner or our dogs peeing on the rug,” Brickell says. “Does Paul pee on your rug?” Martin asks with classic deadpan. “After the dog. Show him who’s boss,” Brickell retorts. Such banter showcases a friendship that started with an encounter in New York City 26 years ago. “I was 23 and I met him at a dinner party,” Brickell recalls. “I was 70,” adds Martin, who just turned 70 in August. “He was the sweetest stranger I’ve ever met. He was sitting across the table and he broke this garlic matzah and said, ‘You really gotta try this.’ It meant so much to me,” Brickell says. “That really doesn’t make a person kind,” Martin quips. Over the years, that friendship has evolved into a successful working relationship over two bluegrass albums, “So Familiar” and “Love Has Come For You,” the title track of which earned a Grammy. “Bright Star” runs now through Jan. 10 at the Kennedy Center. Click here for ticket information.